The finished dual-tone hand siren. Click to view larger in a new window. Back in 1999, I made my first siren purchase ever, purchasing the guts of a Federal Signal Model 77GA fire engine siren. This siren was heavily-corroded, had no housing, but was functional. The Ebay seller's photo is shown below left, and the right photo is after my initial restoration. 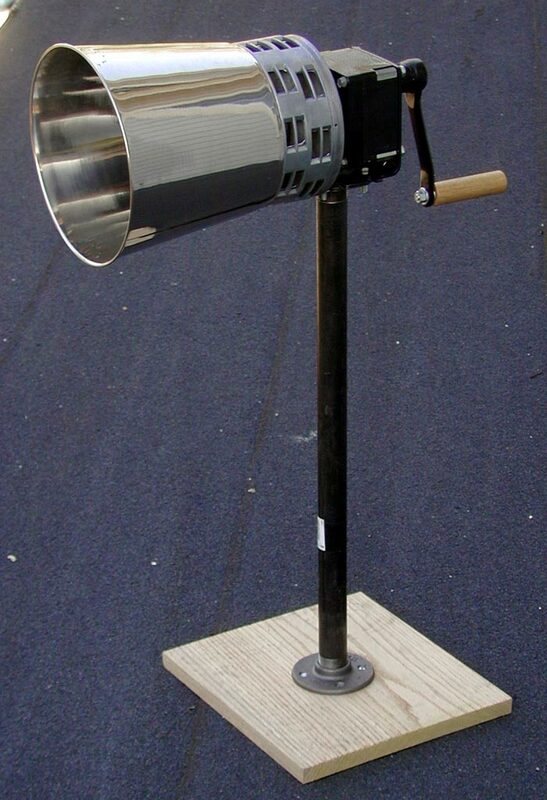 This siren is a very unique fire engine siren, since it was the only dual-tone design ever made by any fire engine siren manufacturer (Federal models 76, 77, and 78 use this design). The dual-tone stator/rotor setup has 8 and 9 ports, producing a musical interval of a whole step (2nd). Listen to it here: y2ksiren.mp3 The slow startup in this file is due to the fact I was running this from an underpowered 12V transformer instead of a 12V car battery, which would have worked much better. This was fun and all, but then I got really interested in hand-crank sirens. 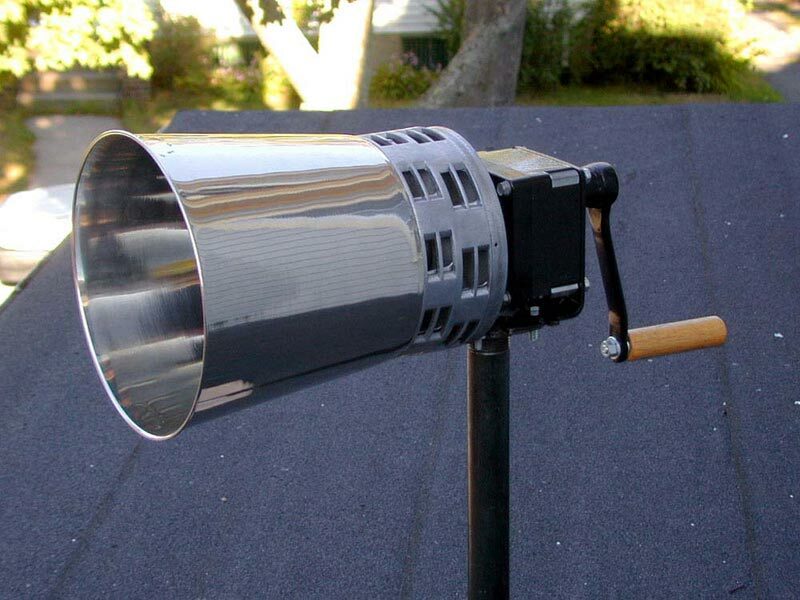 I desparately wanted to build my own (this is before I could afford or find any real hand sirens). I decided to find a gearbox and convert my Model 77 to a hand siren. First, I removed the motor from the siren head, which proved to be far less easy than it looked. I took out all the set screws from motor's shaft collar, but the collar would not come off. I ended up resorting to some hacksaw action, but I was careful to preserve the siren's one-way clutch. The clutch is what makes the model 77 a long-rolling siren like the modern Q2B. It couples the motor shaft to the rotor when the motor is accelerating, and allows the rotor to spin freely after power to the motor is shut off. This allows the rotor to coast freely for a very long time--much longer than if it were to remain coupled to the motor, which slows down quickly due to brush/commutator drag and other friction. This prototype was wonderfully successful, but had many shortcomings, so I started on the final product shown at the top of this page. The gear ratio of 35:1 proved not quite high enough to allow for single thrusts of the handle to bring the siren up to speed (my goal). 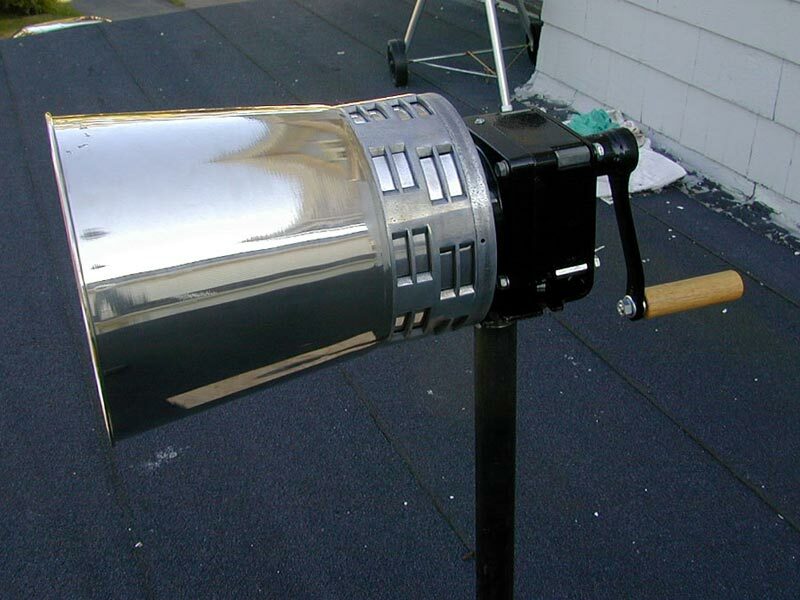 Also, the Dayton speed reducer had no tapped holes on the high-speed side for attaching the siren head. The final version has a 43:1 gearbox from a Bodine 1/4HP gearmotor. It was NOT easy mating this new gearbox to the siren head either! The gearbox's first pinion is milled right into the shaft of the gearmotor, so I had to preserve that shaft for my siren. I used a hydraulic press to strip the armature from the motor shaft, then I turned the shaft down in places to make it fit the siren's bearings and clutch. This process happened in my spare time over many weeks, and was a lot of work. Handle: Same Husky™ wrench as before, but sawed in half and hot-forged to the proper angle with many a hammer blow. The business end of the box wrench was then welded to half of a 5/8" keyed shaft coupler, to enable it to attach securely to the gearbox shaft without any slip. The shaft coupler came from Grainger also, and I sawed it in half myself. The part of the handle you grip is made from a 7/8" hardwood dowel, heavily laquered, drilled down the center and slipped over a 5/16" lag bolt that forms its core. Ball bearings at each end of wood handle keep it turning smoothly on the bolt shaft. The metal parts of the handle were all finished with black appliance enamel to match the gearbox. 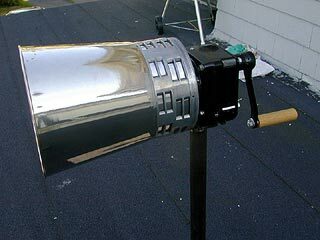 Projector Cone: The projector cone on this siren was originally a Furio chrome-plated ice bucket ($15). I went to the Target store near me, and found this item which was appropriately sized for the job, drawn from of heavy-gauge stainless steel (seemless! ), and with a very nice plated finish to boot. I drilled out the spot welds holding the handle on the bucket, and then cut off the bottom of the bucket at just the right point to make it fit the diameter of the siren stator. Target had a few different buckets and metal waste baskets that would have worked, including a nicely flared spun aluminum one that was just too expensive to consider ($40). Stand: I drilled holes in the gearbox's original mounting plate, and bolted it to a 1" iron pipe flange. The stand pole itself is a 1" diameter black iron pipe 24" long. Another flange at the bottom secures it to a hardwood base. This final product is as robust as anything you can get commercially, and it has the distinction of being the world's only dual-tone hand-crank siren. For now at least, I have since purchased 2 more dual-tone 70-series sirens on eBay which will become similar. If you're interested in making one for yourself, I'd be glad to advise. Here is the approximate cost to do a similar project. 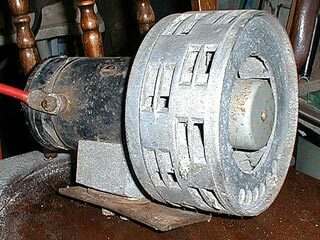 Cost can vary greatly, depending on your luck finding a siren at a good price, and finding the gearbox surplus. 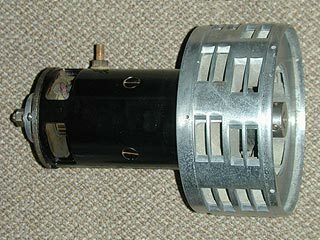 I pay around $125-$150 for Series 70 sirens (typically in worn condition), but fully reconditioned they can fetch $300 to $450. The table below gives both best and worst case prices for each of the major parts of this project. Labor, time and tools are not reflected in these prices, nor are the shipping costs or taxes associated with purchasing the parts. My hand siren project easily cost me over $300 in parts, when these costs were factored in. Also, it takes a lot of tools to make this kind of project happen. Access to a full machine shop is ideal, but the project can be completed with basic shop tools. 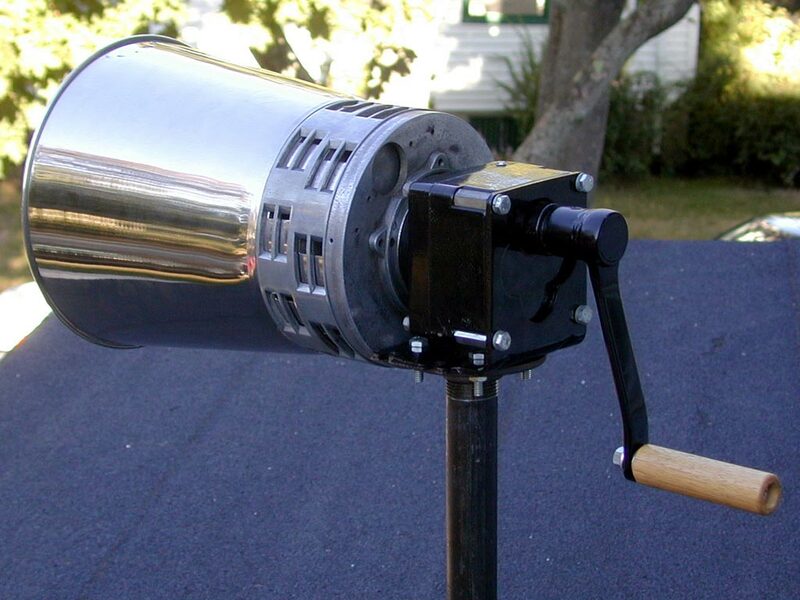 An arbor press, drill press, hacksaw, welding setup and angle grinder are essential. An abrasive-disc chop saw is also handy.